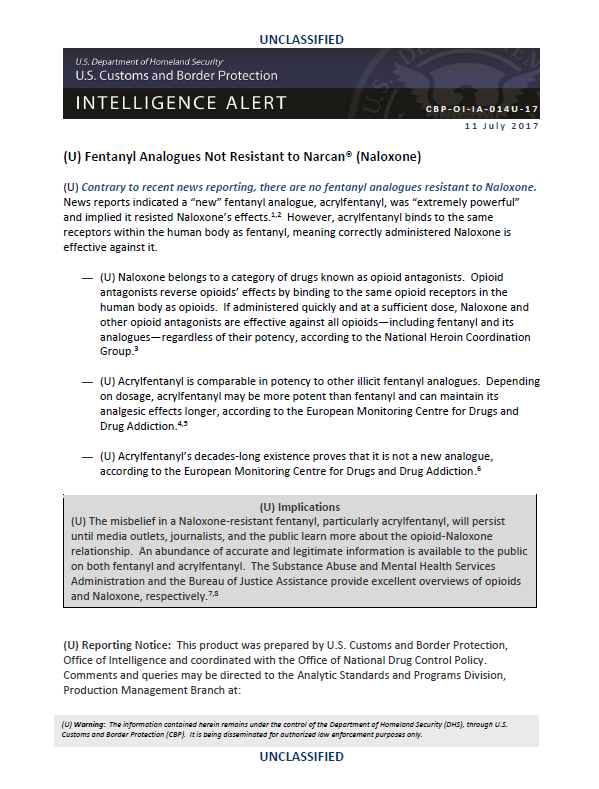 (U) Contrary to recent news reporting, there are no fentanyl analogues resistant to Naloxone. News reports indicated a “new” fentanyl analogue, acrylfentanyl, was “extremely powerful” and implied it resisted Naloxone’s effects. However, acrylfentanyl binds to the same receptors within the human body as fentanyl, meaning correctly administered Naloxone is effective against it. — (U) Naloxone belongs to a category of drugs known as opioid antagonists. Opioid antagonists reverse opioids’ effects by binding to the same opioid receptors in the human body as opioids. If administered quickly and at a sufficient dose, Naloxone and other opioid antagonists are effective against all opioids—including fentanyl and its analogues—regardless of their potency, according to the National Heroin Coordination Group. — (U) Acrylfentanyl is comparable in potency to other illicit fentanyl analogues. Depending on dosage, acrylfentanyl may be more potent than fentanyl and can maintain its analgesic effects longer, according to the European Monitoring Centre for Drugs and Drug Addiction. — (U) Acrylfentanyl’s decades-long existence proves that it is not a new analogue, according to the European Monitoring Centre for Drugs and Drug Addiction. (U) The misbelief in a Naloxone-resistant fentanyl, particularly acrylfentanyl, will persist until media outlets, journalists, and the public learn more about the opioid-Naloxone relationship. An abundance of accurate and legitimate information is available to the public on both fentanyl and acrylfentanyl. The Substance Abuse and Mental Health Services Administration and the Bureau of Justice Assistance provide excellent overviews of opioids and Naloxone, respectively.